There’s a timelessness about a house built with raw earth. Not surprising though since building with earth is truly prehistoric. Yet rammed earth is very contemporary. In fact, still today, over half of Earth’s population dwells in earthen housing. The process of creating walls is done by ramming, or compacting, earth into forms that create straight sturdy walls. Various types of earth can be used to create striations in distinctive hues mimicking natural earth formations. Rammed earth techniques create beautiful thick walls that won’t contract and expand but surface cracks may occur, adding additional character without any compromise to the structure. It’s regional (making it easily attainable), natural, durable, strong, provides excellent thermal mass, load bearing, natural, and of course, recyclable. Fireproof and characteristically substantial, giving them the ability to withstand tornados and hurricanes far better than a traditional stick-framed home. Relatively low-cost-after all raw earth is abundant and practically free. Well suited for solar heating and cooling. Beauty, practicality, quiet and a distinguished sense of place. Cob homes are highly creative, individual yet, can blend in beautifully with the environment. Literally formed by hand and then kneaded like dough into form, it lends itself to gracious curving, flowing walls, roofs and décor. Cob is the British word for lump or rounded mass used for centuries in the traditional mud buildings throughout the UK. Cobs are hand molded ‘loafs’ using a mixture of mud and straw and then layered to create a structural wall. They can be used as infill or completely load-bearing. It is likely the oldest earth-building and certainly the simplest. It requires no equipment, is perfect for self-building, highly sculptural, and is completely recyclable, non-toxic and sustainable. Insect proof, fire proof, wind and earthquake resistant, and can last for hundreds of years. 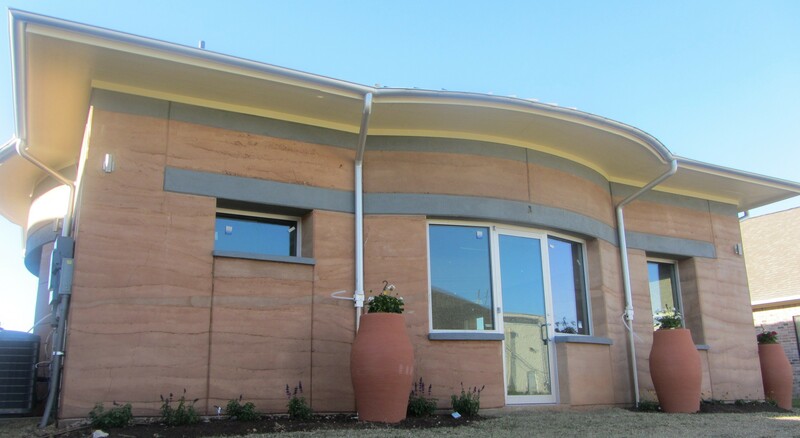 Cob structures offer exceptional flexibility in design, and because of its extraordinary thermal mass, are ideally suited for solar heating and cooling and have a sense of quiet. Adobe is probably the most familiar of earthen building material and has most of the same advantages as rammed earth and cob. Like the others it replaces the use of scarce resources like wood and the material is generally locally available. Adobe, a time-honored building method in the American Southwest, has also been utilized around the world throughout the centuries. Amazing what can be done with a pile of earth.